This tenth volume in the series is the first to be released on the Hyperion label and the first to feature music from Byrd’s consummate collection of 1591. 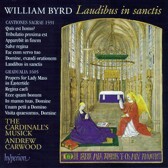 The first seven motets are featured on this disc including the scintillating setting of Psalm 150 (Laudibus in sanctis) as well as more meditative motets such as Quis est homo and the exquisitely devotional Salve regina. From the Gradualia are the Propers for Lady Mass in Eastertide and some more general motets – two psalm settings and two motets which take their inspiration from Compline – which create one of the most varied and satisfying discs in the series.